Presented by The Academy for Academics and Arts Parents...Spring Fling - 80s Edition. 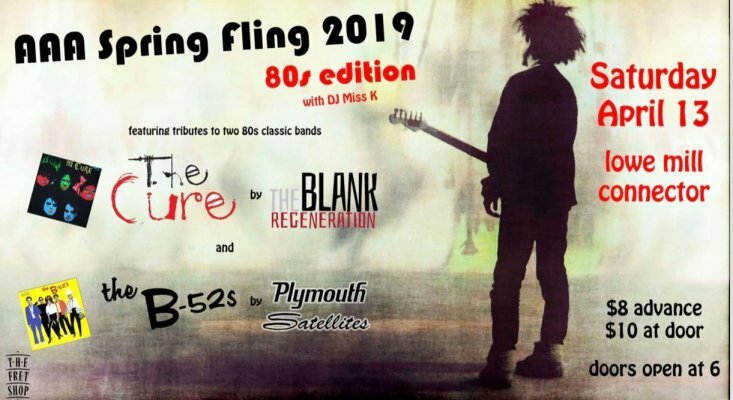 The Plymouth Satellites and Blank Regeneration will be playing music from the B-52s and The Cure in epic 80s fashion. Be sure to stop by the auction to purchase one of a kind art from local artist and students from AAA. All proceeds from this fundraiser will support all students at this local magnet arts school. Dress up in your favorite 80s attire and bust out those dance moves. It’s going to be a RAD night! The auction starts at 6:00. Music at 6:30. $8 in advance $10 at the door.